Right, another often question that arises among Photoshop users is “I have finished editing all my images in Photoshop and How do I save all the open images automatically?”. Well, if you were among one of them, I would suggest you to read this. Sometimes it gets more annoying in Photoshop to sail through File -> Save/Save as -> choose the file type as Jpeg -> choose desired quality -> click save. If we have like 5 or 10 open images awaiting to be saved, it’s fine! What if we have got more than 15 or 20 images to save? Irritating right? Well, there’s an infamous option in Photoshop which allows us to save all the open images at the same time with the settings we choose! Exiting right? Cool, let’s see how to do it…. File -> Scripts -> Image Processor…. 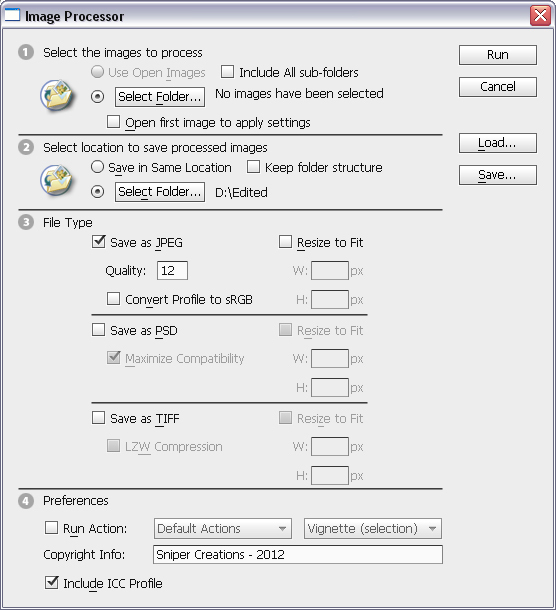 Select the images to process (if you are intending to save multiple files, choose “use open images” option. Include copyright metadata into the converted images.